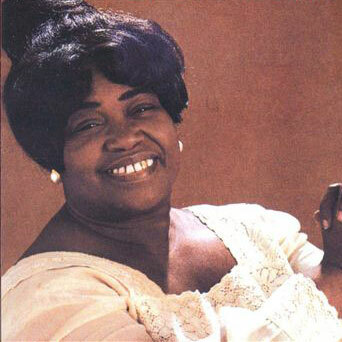 With an amazing grace, a powerful, yet lyrical voice and unmatched improvisation skills, Marion Williams punctuated her sanctified shouting with gut-wrenching growls, low moans, joyful whoops and soaring, angelic falsettos that made her one of the most influential singers in gospel music. In her heyday she was hailed by some critics as one the greatest singers in the U.S.
Williams was born in a Miami ghetto, the daughter of a West Indian butcher and a South Carolina laundry woman. When not working, her father would give music lessons, while her devout mother introduced to her to religion. Williams' own love of gospel music began in childhood, and she would sing and listen to it at every opportunity. One of her older brothers frequently played blues and jazz on the family jukebox; although gospel was Williams' main interest, her music is infused with elements of those jukebox tunes, as well as the calypso music played throughout her neighborhood. When she was nine, her father died, and at age 14, Williams quit school to work all day in the laundry beside her mother. Later the responsibility for supporting the family fell totally on Williams' young shoulders when her mother lost both legs due to diabetes. Still her interest in sanctified gospel continued, and on weekends she sang in church programs and on street corners. She was particularly inspired by the Smith Jubilee Singers (her favorites) and the Kings of Harmony; influential soloists included such women as Mary Johnson Davis and particularly Sister Rosetta Tharpe. Williams' extraordinary singing attracted considerable attention, but though attempts were made to steer her into everything from opera to the blues, she was determined to spread the gospel and by 1946 was known as the best gospel soloist in Miami. While at a Clara Ward and the Ward Singers program, Williams was called up to sing. Impressed, Clara and Gertrude Ward invited the young singer to join their nationally known group. The following year, she joined the Wards and remained with them for the next eleven years as their star attraction. Her natural sparkle and enthusiasm in performance earned her the nickname "Miss Personality." She made her recording debut singing "How Far Am I from Canaan" with the Ward Singers in 1948 for Savoy; it was the Rev. W. Herbert Brewster-penned "Surely God Is Able" that made Williams and the Ward Singers stars. During their dynamic performances, it was not uncommon for audience members to fall out in frenzied ecstasy, something Williams encouraged by getting right down into the audience, sashaying about and shouting at the top of her lungs, occasionally sitting demurely upon listeners' laps, and even literally trying to pack up the earthly goods of audience members during her renditions of her second big hit, "Packin' Up." She put so much into her performances with the Ward Singers that in time she began suffering "nervous spells" in which she would yell just to express the remaining energy generated by singing those high notes. Williams and a few others from the group left in 1958 to form Stars of Faith. The Stars of Faith got off to a rocky start as they lacked many of the things that made the Wards great, including Gertrude's ability to manage, Clara's driving vision, and Brewster's exquisite songs. It did not help that Williams was not putting the energy into singing she did with the Wards. She frequently allowed other group members to do the shouting and avoided the vocal extremes that characterized her earlier work. The lull continued until 1961, when she again found Jesus and approached music with renewed vigor. She and the Stars got major exposure when they appeared in the off-Broadway production Black Nativity and began touring North America and Europe. Williams left the group in 1965 to launch a solo career. Returning to Europe, she appeared in an unsuccessful show until her mother's death caused her to go back to Miami. It was at her mother's funeral that she became committed, bringing back her old fire to her new career. Starting at Yale, Williams began a long series of college campus tours that gave her the opportunity to thrill audiences in North America, Europe (where she also appeared at jazz festivals), Africa and the Caribbean with stirring renditions of such great songs as "Jesus Is All" and her biggest solo hit, the reflective "Standing Here Wondering Which Way to Go." In 1993, Williams became the first gospel singer ever to receive the Kennedy Center Honors; released a new album, I Can't Keep it to Myself; and received a MacArthur Foundation "genius grant." Though she died in 1994, Marion Williams' influence upon contemporary music continues to be felt.